About.com produced a fantastic article highlighting one of the number one ideals for losing weight, and keeping it off….Portion Control. 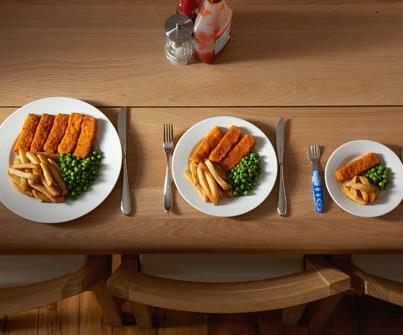 Ask anyone who has achieved long-term weight loss how they did it and they’re sure to mention portion control. In fact, it can make or break your weight loss efforts. Learn how to size up servings and avoid overeating with the Top 10 Ways to Control Portions. Instead of using one large container to store leftovers such as casseroles, side dishes, or pasta, why not separate them into individually-sized containers?That way, when you reach in the fridge to find something to reheat, you’re retrieving just enough for one helping. Breaking down meal-sized servings into single servings will help you limit your food intake with no additional effort. Eating a salad before lunch or dinner is a sure-fire way to keep from overeating. It will help curb your appetite and give you a sense of satiety sooner.Of course, we’re not talking a little bit of iceberg lettuce here. To reap full portion control benefits from rabbit food, load up your salad with veggies or even lean meat like turkey cubes. The fiber in the veggies will help you feel fuller and lean meat’s protein will give you an instant energy boost. Buy snack foods in single serving sizes or divvy up full size packages into smaller, indvidual bags.It may be difficult to stop eating, oh, say, tortilla chips (My biggest weakness!) straight out of the bag while watching Desperate Housewives, but am I as likely to inhale the contents of 12 zipper bags without some forethought? Doubtful. You can make sure your blood sugar stays at an even keel and keep hunger at bay by eating healthful small meals throughout the day.My friend Jenn has maintained a 30 pound weight loss for three years and is in such great shape, she became an aerobics instructor! She swears by mini meals to maintain her weight and keep her energy level up. Mini meals are by far the best way to prevent overeating because you’ll get never too hungry and lose control of your portion intake. Don’t serve family meals family-style. Keep pots and dishes away from the table where it’s all too easy to go for seconds.I can’t tell you how many times I’ve rethought my second helpings as I’ve made my way from the table to the stovetop. I’ve often told myself to sit back down and wait it out. Remember, it takes about 20 minutes to feel satiated. By giving myself that “breather” I’ve realized I wasn’t hungry enough for another helping after all. Treat meat or meat-based entrees as a side dish rather than the main part of your meal.By loading up on veggies and healthy grains as the bulk of your meal instead of using them as sides, you’ll feel full sooner and get extra vitamins and fiber. Experiment with new vegetables and preparation methods to keep things interesting. Make lunch a two-fer. Your mid-day meal can work double duty by being shared or serving as dinner.At work, why not split take out with a buddy? At a restaurant, pack up half of your meal before you even start eating: Voila! You have an instant dinner! Order a kid’s size meal when you go to fast food places to automatically control portions (and save money! ).Don’t be embarrassed about asking for a child’s meal. It’s really no big deal. I’ve even got a trick for places that have a “12 and under sign” — I order it to go and then plop right down in the dining room, eat my meal, and give the toy to a kid sitting nearby! Learn to “eyeball” standard portion sizes and stick to them when dining out or dishing up meals.Keep these tips in mind: 3 oz. of meat is the size of a deck of cards or an audio tape; 1 oz. of meat is the size of a matchbook; 1 cup of potatoes, rice or pasta looks like a tennis ball. And last, but not least … indulge!Treating yourself once in a while to a “forbidden” food will keep you from feeling deprived; a sense of deprivation can easily lead to overeating. Stop a binge before it starts by indulging every now and then.